How to Make Cute Denim Personalized Name Pillows - they can be NO SEW! One of my best friends, Crystal, just had a baby. A boy! Another boy. Her third boy to be precise. Life brings lots of challenges, but near the top of the list is figuring what to give friends who just had their third boy. They clearly don't need clothes. They don't need toys. They don't need anything. But I have a deep need to show them how much care and excitement I feel for them. So I created a gift for all three boys - to celebrate their new boy hat-trick together. She loves her boys' names. Her boys love their names. If you've hung out on our blog before, you know I've shared my Easy Way to Sew a Pillow before. Early on in the idea phase of this project, I planned to sew these three pillows myself. Then reality set in (at 8 pm Saturday, the night before the big gifting day). This is way too much to do on way too tight a schedule. These pillows were purchased. Walmart was the only store open at 8 pm on Saturday night. I lucked out that they had these three, ultra suede pillows in happy Apple Green. They are durable and washable; two qualities absolutely essential for gifts for any kids. So, after second guessing myself for another half hour, I bought them. The first step was to find the perfect font. I started at my favourite free front website: dafont.com No word of a lie, I can spend hours on here looking for the perfect fonts. There are so many great options. I chose Musa for these pillows. It's bold, had a hand-made feel and was the right shape for my patches. This font also looked pretty forgiving if I didn't get the shapes trimmed up quite perfectly. After downloading the font, I opened up Word and typed in the boys' names. Then I increased the font size until they fit my vision: basically large enough to max out the length and width of the patch. I printed the names and double checked that the letters would fit on the patches. They did! I chose the order of colours for each letter of each name. Next, with a pencil, I traced the paper letter templates onto the denim patches. Tip: DON'T use plastic tipped pins. They will melt with the heat of the iron. I stopped it in time, but wish I had thought of that first. Iron the letters in place. Tip: (Which I actually did this time.) Use a pressing cloth. 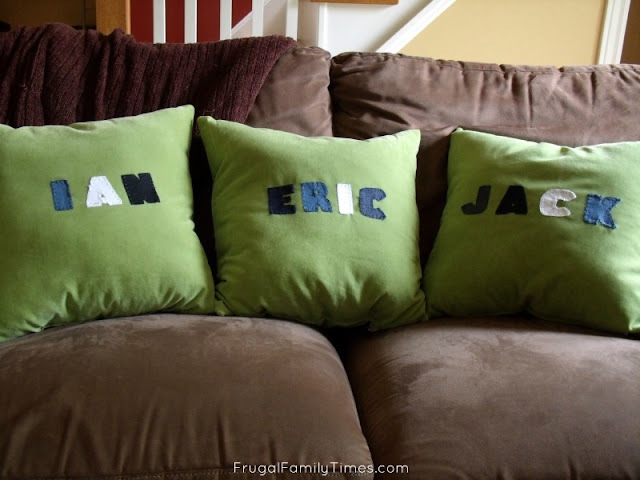 You will want to go over the letters a few times with the iron and you don't want to scorch your letters or pillow fabric. If you want these to be NO-SEW - here's where you call the project DONE! The last step was to Blanket Stitch around the letters. I chose a navy thread for all the letters, and then tore out the stitching around the white letters. I re-did those with white. The dark stitches on white were looking a bit too Jack Skellington for my taste. You might be able to skip the blanket stitching, the adhesive on the patch could be strong enough, but I thought it was important to make these pillows as durable as womanly possible. I pictured pillow fights and cars driving on them (toy cars, I hope!) and sitting on them while sledding down the stairs. I wanted these to be pillows that could be played with. We took over a meal to enjoy together. We brought along Ed's Homemade Pizza Dough and he helped the kids make their own. He also made chocolate cookies, which we sandwiched around ice cream for dessert. I sat preoccupied for about an hour before the nerve came to give them their gift. "The Nerve" was disguised as my two children who grabbed the enormous bag and thrust it at Crystal (after giving their trademark sneaky extremely obvious hints as to what was inside). But the older two really liked them. The 3-year-old dragged his around all night and Crystal snapped a picture of him sleeping on top of his "Ian" pillow that same night. Crystal really enjoyed the gift too. Relief and joy washed over me. Do you get nervous before giving gifts you've made? Such cute pillows and sweet gift for your friend. Great tutorial too! Happy to be visiting with you! Thanks, Lorraine! These were as fun to make as they were to give! Super cute! I love the idea of using the iron-on patches. Iron patches pillow information is really useful. i read your blog and i get the some useful information on this blog. Thanks for posting something worth reading. Great work.